Comfortable and spacious room, excellent shower, good breakfast and very helpful staff. The owner Sonu made surs I got an appointment for treatment the next day after I broke a tooth, and also went out of his way to sort out an issue we had with our mobile sims. A short walk to Saket metro for easy access to the centre and tourist areas. Clean, comfortable rooms. Helpful manager and hardworking support staff; delicious breakfast. Great location; walking distance to metro, cinema; short taxi ride to major mall. anand and his team were very hospitable, hands on without being intrusive. thoroughly enjoyed the short stay. very comfortable too. highly recommended. The staffs are very nice and friendly. They are so welcome to help when we ask so. The location is a but difficult to findo if you aren't familiar with the area. The food are excellent and the room is so cozy. Big tasteful furnished room. Nice service and great breakfast. Owner and Manager are helpful to organize transportation. We really liked the service that we received from the owner and his staff, however when we arrived from a long trip, the room was extremely cold and we both woke up sick from being chilled.The mattresses were extremely hard and thin, and the bedding was the most basic. No extra pillows or blankets. The breakfast was adequate but of the many places we stayed on our trip, it was the most basic. Having said that, if these things are not important, I would recommend Saket B and B because of the location and the helpfulness of the owner and his staff. (1)There are no proper room service (2)Daily there are same breakfast (no other option) (3)Room condition is ok but not good. We thoroughly enjoyed our stay. As I said in the title it was like home away from home. Sonu and staff was always there for help and advice and anything you might need. We arrived at 4am and were provided temporally accommodation to sleep until our room is available later in the morning. We left for the airport early and we were given packed breakfast. We really loved it there. We would stay there again and every time if we ever go back to Delhi. the room is clean and elegant, common space is confortable, easy to get auto rikisha and atm is nearby. good place to stay. Everything ok, but problematic to find the place. You need Tel. no of guesthouse before you start yr travel. Owners really know how to relate to Westerners. It was also very clean. close to pvr saket, the metro and select city walk mall. very relaxing place and the managers are very friendly. we'll be going back. only complaint is that the tv wasn't working in our room at the time. We had a wonderful time at Saket B & B. The rooms are clean, the service is wonderful and the owner/manager was kind, helpful and even came down to bid us fairwell. This is the only place I would stay in Delhi. Excellent place to stay. No fuss but very efficient service. Food is good but should be ordered well in advance. Great breakfast. Nice, clean large rooms Located in a good location with walkable options for food and entertainment breakfast is just about decent. A bit inconvenient. U need to ring the doorbell to open the door, no food options if u land at your hotel after a late meeting. I must say first I was apprehensive to book and live. I decided to take a plunge and am glad I did. This place offers a luxury stay in affordable prices. THe place is a house in New delhi's posh locality and next to cinema, eating places. The apartment has been remodeled to convert into renting rooms for travelers looking for modern hotel amenities with the comfort of an apartment. the hosts are very friendly, they let me in at 1 in the morning :). also the room is squeaky clean and very nice. They also offer good breakfast but if you like, eating places are just walking distance away. We had a 3-day stay on our return to Bangkok. 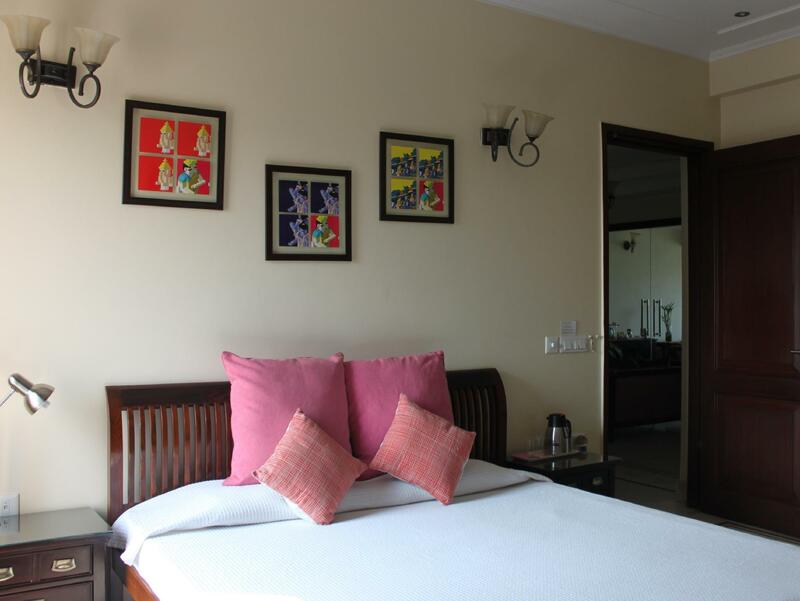 The rooms are spacious and clean and the staff members are a delight to talk to and always at your beck and call. A true value for money for budget travelers like us. PS: Could do with more breakfast tables so couples and small families like ours can enjoy breakfast in privacy. Although about 30 minutes out of Delhi on the Metro it is worth the distance. Helpfull owners live on site and the home is quite western with tiled floors and modern bathrooms and big bedrooms. Handy to Metro and the Saket huge shopping complex with other site seeing attractions in the area. the hop on hop off bus stops at the shoopind mall and you can pay on the bus. Staff were polite and very helpful. Room was spacious and well furnished. Value for money is excellent. Breakfast is adequate and service superb. The comfort provided was extremely welcome and to a very high standard for a B&B. The hotel manager took time to help us plan our sightseeing and recommended places to visit and to avoid! The hotel was one of the highlights of our trip. We will definitely be returning to this hotel! A fantastic hotel and a very pleasant surprise. สถานีรถไฟใต้ดิน Saket - ระยะ 0.34 กม.